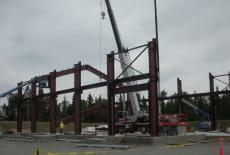 CINGSA, a subsidiary of Semco Energy, is building a natural gas storage facility in Kenai, Alaska to initially hold 5 billion cubic feet of natural gas. The general contractor chose Portland Bolt to supply the anchor bolts for the aggressive construction schedule. They needed a supplier that could supply galvanized headed anchor bolts for a fast track construction schedule. Portland Bolt was chosen due to our in-house hot dip galvanizing ability and our headed anchor bolt capabilities. Portland Bolt manufactured 17,000 pounds of galvanized F1554 headed anchor bolts for this project. Most of these releases were shipped within 1 week of the release date.